Professor Hirano graduated from Tohoku University’s biology program in 1978. In 1983 he completed the graduate course of biochemical regulation at Nagoya University. He then became a fellow at the Japan Society for the Promotion of Science (Tokyo University), and became an assistant professor at the National Institute of Genetics in 1988. In 1996 he became an associate professor in the University of Tokyo Graduate School of Agricultural and Life Sciences, and obtained his current position in 2004. Did you know that the great writer Goethe was also a botanist? In his 1790 book Metamorphosis of Plants, he states, “flowers are a metamorphosis of leaves.” Goethe had carefully observed flowers by employing sensibilities honed through his creation of poetry and novels, and this was the conclusion he was led to. It was not until two hundred years later, in 1991, that Goethe’s words were confirmed experimentally by modern biological research. That was the year in which the four floral organs—sepals, petals, stamens, and carpels—were found to be determined by three classes of floral homeotic genes (A, B, and C genes). Through his rice studies, Professor Hirano has been revealing mechanisms unique to monocots. Although the ABC model serves as a foundation, Professor Hirano has revealed that a new gene, which was not involved in the model, plays a key role in pistil development. The research theme of the Hirano Laboratory is evolutionary genetics. Genetics research starts with the discovery of mutations. Collecting a sufficient number of mutations requires examining a large number of samples, so working in rice paddies is a big part of the research process. Another characteristic feature of the Hirano Laboratory is teamwork that spans generations. “Rice only produces one generation per year. If one were to make a solo attempt at finding mutations, isolating the target genes, and figuring out their function, that would easily take three to five years,” explains Professor Hirano. Current students pick up from where their predecessors left off, and leave the seeds of their own research to be carried on by subsequent students they may never meet. Sometimes these are literal seeds, those of mutants they found in the field. Just as seeds connect generations of plants, so too do they connect generations of research at the Hirano Laboratory. 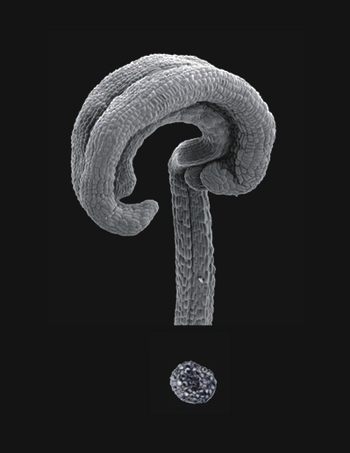 A question mark formed by a mutated rice stamen, inspired by the fact that research begins with simple questions. This image entitled “The Spirit of Science” won second place in a 2011 University of Tokyo scientific imagery contest, and, since then, the image has been used in promotional posters as a symbol of the contest. The entire laboratory team, planting rice.